In this section we strive to provide fresh content on these featured iconic rock poster artists from the 60s. Though bios and certain pertinent information have been written many times, we will attempt a new approach and hopefully give you a different view of very available material. Palos Verdes, California’s native son – Richard Alden Griffin was born on June 18, 1944. Famously known as Rick Griffin “One of the world’s least known and most influential 20th Century surrealists”. I love that one. Iconic to say the least. You recognize Rick’s work and style immediately. Lets get into that “style” for a minute. Many pieces from this artist you will see an homage or a nod of style going to the Native American Indian. If you didn’t know…his father was a lay archeologist and would take him on trips to the Southwest as a child. The artifacts – finds and experience of these trips would be an obvious influence in his later works. 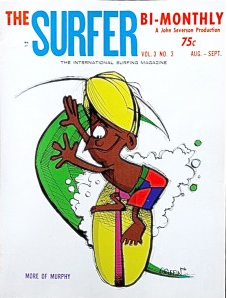 Also, widely published is Rick’s obsession with surfing and “Duke” of surf art. In 1962 he was good friends with John van Hamersveld (who designed “The Endless Summer” movie poster). They used to surf together in Torrance Beach. Rick was already doing a comic strip called “Murphy” for Surfer magazine and he was instrumental in getting John van Hamersveld an opportunity there. 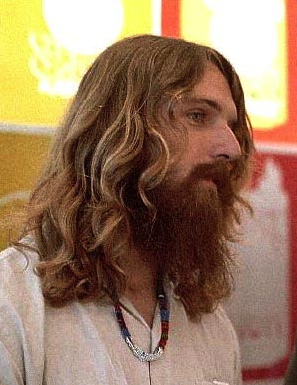 John has been quoted saying “The Endless Summer” image grew out of his relationship with Rick Griffin and their deep relationship at Surfer magazine. 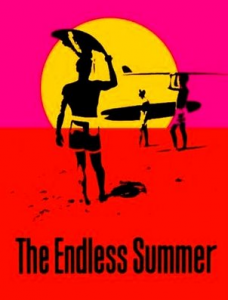 (The Endless Summer poster now hangs in The Museum Of Modern Art in New York as a part of their Design Collection. Also, it has been credited with influencing later rock posters-with its design and day-glow colors). More discussion in these pages on the relationship, life-style and common denominator of styles of these two artists. Rick quit Surfer Magizine in 1964 and was planning a move to Australia. After hitching a ride to San Francisco, the car crashed leaving him with a dislocated left eye injury. One could imagine this being an inspiration in some of his work with the the floating eyeball themes. Rick then spent some time at Cal Arts and met his future wife Ida there. It was then in late 1966 that they met up with friends (and band) Jook Savages Art Show in San Francisco. 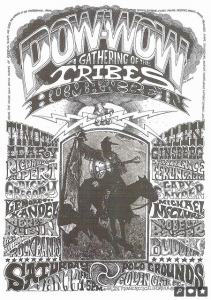 His first rock show poster was for them and then he did the poster for “The Human Be-In” named “Gathering of Tribes” (above). This kicked off the famous counter-culture “Summer of Love” 1967. Rick Griffin went on to be a prolific artist of the era. Rendering more and better poster art for iconic SF music venues, album covers for rock groups, a long standing relationship with The Grateful Dead, and even more comic books. He was taken from us much too soon and had so much more to give. On some back roads (on his way home) he was run off the road and killed after trying to pass a car with his Harley in 1991. A good history of each of these artists and knowing their environment will help you understand the many facets of topics we will be discussing here. Like: How they became psychedelic poster artists? How did such a wild and unbridled poster style(s) develop? How did San Francisco become “ground zero” for most of the classic posters worth thousands of dollars, now? How did this genre of art come to have permanent status in Modern Art Museums around the world? We will explore these topics and much, much, much more in our articles and blog pages.